In one of his most striking works, Hybrid Reality, Reji Arackal paints the human society as a production factory, using charcoal and soft pastels on paper. A single, shapeless mass is being cut, sawed, pulled, stretched and shaped to meet various needs of the society. “We live in a hybrid world where things no longer happen naturally. We all are physically and mentally tuned to the mechanical clock, and machines and have become small cogs in the big industrial unit,” explains the 39-year-old. Ten of his works make the exhibition “Living Outlines”. Organised in collaboration with The Raza Foundation, it is the second in the ‘Back from France’ series, wherein two solo exhibitions of Indian artists are held every year, of those who have lived in France for more than six months and are now continuing their practice in India. “Humans are like bugs, trying to control every living thing on earth. We convert living, thriving habitats into artificial, dead spaces, and are no longer able to differentiate between what is precious and living and what is artificial. We have lost the balance,” says Arackal, the Wayanad-born painter and new media artist, who has been trained in Trichur’s Government College of Art, the Visva Bharati University, and École nationale supérieure des Beaux-Arts in Paris. 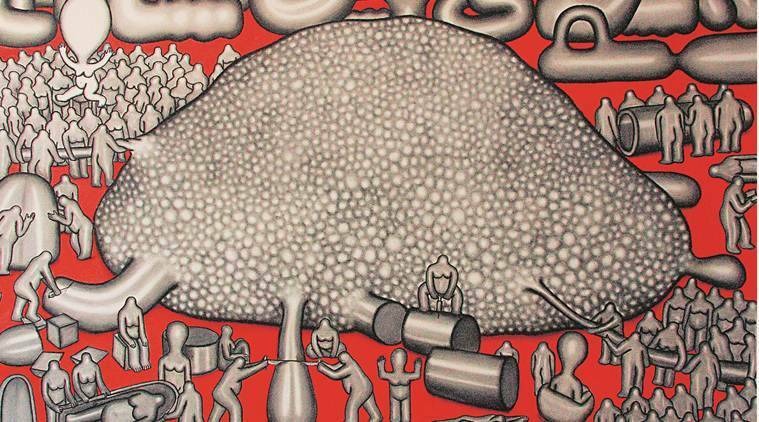 He has been exhibiting his works around India since 2013 and has had solo exhibitions in Mumbai, Trichur and Calicut, apart from various group exhibitions. The exhibition also comments on man’s penchant for violence. In The hunter/Mirror image, the “new-age, God-like” soldier reaches out to a cave man with his primitive spear, taking cue from Michelangelo’s fresco The Creation of Adam. But here, we see an imaginary map of Wayanad with names of villages that were once thriving but have now been displaced from the collective memory. In all works, we see his signature “god-like superhuman figures” inspired by the sculptures in the ancient temples of south India. The exhibition is on at Alliance Francaise de Delhi till March 28.